Le Grand Tango (Arranged For Solo Cello And String Orchestra). By Astor Piazzolla (1921-1992). Arranged by Paul Salerni. For violin 3. Part(s). Published by Berben (PR.57601922D). 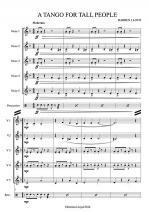 Le Grand Tango (Arranged For Solo Cello And String Orchestra). By Astor Piazzolla (1921-1992). Arranged by Paul Salerni. For violin 2. Part(s). Published by Berben (PR.57601922C). Le Grand Tango (Arranged For Solo Cello And String Orchestra). By Astor Piazzolla (1921-1992). Arranged by Paul Salerni. For violin 1. Part(s). Published by Berben (PR.57601922B). Le Grand Tango by Astor Piazzolla (1921-1992). For violin, viola, double bass. Published by Berben (PR.514055100). Helena. (Tango-Habanera). By Ivan Boumans. For violin, piano. Collection Guy Comentale. Score and part(s). 4+2 pages. Duration 3 minutes. Published by Gerard Billaudot Editeur (PR.514055350). ISBN 9790043091769. Led Zeppelin -- Coda Platinum Bass Guitar. (Authentic Bass TAB). For Bass Guitar. This edition: Authentic Bass TAB. Artist/Personality; Authentic Guitar TAB; Bass Guitar Personality; Book; Guitar TAB. 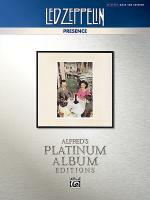 Alfred's Platinum Album Editions. Pop/Rock; Rock. 68 pages. Published by Alfred Music Publishing (AP.40942). ISBN 0739095692. Pop/Rock; Rock. Released after John Bonham's untimely death, Led Zeppelin's Coda is a superb collection of various session rarities from throughout the band's career. Drawn from more than 30 years of documentation, interviews, and recorded footage, this bass transcription book delivers unprecedented accuracy. Titles: We're Gonna Groove * Poor Tom * I Can't Quit You Baby * Walter's Walk * Ozone Baby * Darlene * Wearing and Tearing * Baby Come on Home * Travelling Riverside Blues * White Summer/Black Mountain Side * Hey, Hey What Can I Do. Led Zeppelin -- In Through the Out Door Platinum Bass Guitar. (Authentic Bass TAB). For Bass Guitar. This edition: Authentic Bass TAB. 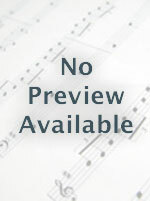 Artist/Personality; Authentic Guitar TAB; Bass Guitar Personality; Book; Guitar TAB. 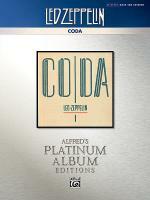 Alfred's Platinum Album Editions. Pop/Rock; Rock. 60 pages. Published by Alfred Music Publishing (AP.40941). ISBN 0739095684. Pop/Rock; Rock. Led Zeppelin's eighth studio album, released in 1979, showcases the band's poppier side. Drawing from more than 30 years of documentation, interviews, and recorded footage, this bass transcription book delivers unprecedented accuracy. Titles: In the Evening * South Bound Saurez * Fool in the Rain * Hot Dog * Carouselambra * All My Love * I'm Gonna Crawl. Led Zeppelin -- Presence Platinum Bass Guitar. (Authentic Bass TAB). For Bass Guitar. This edition: Authentic Bass TAB. Artist/Personality; Authentic Guitar TAB; Bass Guitar Personality; Book; Guitar TAB. 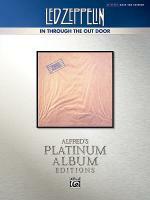 Alfred's Platinum Album Editions. Pop/Rock; Rock. 76 pages. Published by Alfred Music Publishing (AP.40940). ISBN 0739095676. Pop/Rock; Rock. Led Zeppelin's seventh studio album is arguably the band's darkest and most personal. Drawing from more than 30 years of documentation, interviews, and recorded footage, this bass transcription book delivers unprecedented accuracy. Titles: Achilles Last Stand * For Your Life * Royal Orleans * Nobody's Fault But Mine * Candy Store Rock * Hots on for Nowhere * Tea for One.